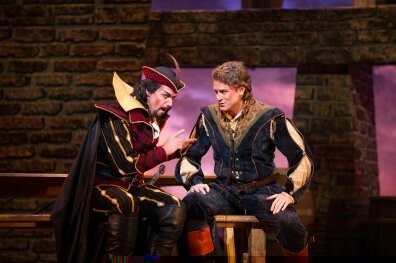 “I just call it ‘Utah Festival,’” said Utah Festival Opera & Musical Theatre director Michael Ballam during one pre-show “informance,” joking that the official title “keeps getting longer.” But the abbreviated title might also be a way of thinking about why it’s not quite the same as a simple summer season of productions. Because like a film festival, UFOMT—now in its 20th season in Logan—offers more than just the productions themselves. Ballam’s “informances” provide background and context for the shows, and biographical information about their creators. Morning “talkbacks” and post-performance availability of cast members allow audience members a chance to interact with the actors and ask questions. Technical seminars provide unique opportunities to take a look at the behind-the-scenes side of theatrical production, from costume design to moving huge set pieces. And that’s not even mentioning the special events outside of the primary-season productions, including an operatic competition and a tribute to Judy Garland. That’s an ambitious approach to involving viewers in live theater, especially for a company that has a very “family business” vibe—at times literally. Ballam’s daughter Vanessa plays the lead in two of this season’s shows; another daughter, Olivia, is part of the season’s company; Vanessa’s husband, Stefan Espinosa, serves as fight choreographer and dialect coach. Throw in several performers who’ve returned for multiple seasons, plus the communal living environment that allows not just the performers but technicians and musicians to interact, and you’ve got a uniquely tight-knit repertory band. Even the season’s four principal productions seem unified; the 2012 quartet might be subtitled “Men Behaving Badly.” The showpiece among the musicals is Lerner and Loewe’s My Fair Lady, with Vanessa Ballam playing cockney flower girl Eliza Doolittle opposite Kyle Pfortmiller’s linguist Henry Higgins. The story has always been slightly problematic—Higgins’ treatment of Eliza being so wretched that her affections can feel forced—but Pfortmiller gives Higgins a softer quality that helps the finale. Michael Ballam, meanwhile, puts on yet another hat by playing Eliza’s father with tremendously entertaining gusto, adding wonderful small bits of physical business to the performance. And the lush orchestrations—played by a larger group of musicians than most theater companies are willing or able to employ—make the magnificent songs even more of a delight, assuming it’s possible for “On the Street Where You Live” or “I Could Have Danced All Night” to be lovelier. 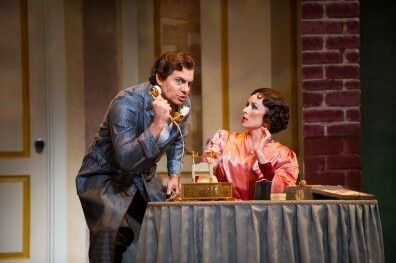 Given that Higgins’ role was written for an actor who could barely sing a note, it might be shocking to hear the operatic magnificence of Pfortmiller’s voice as Fred in Cole Porter’s Kiss Me, Kate, the tale of a down-on-his-luck actor staging a musical version of Shakespeare’s The Taming of the Shrew with his ex-wife (Vanessa Ballam again serving as Pfortmiller’s leading lady). The production is terrifically staged, and it’s hard to resist great individual bits like a pair of gangsters punning through the Bard’s plays in “Brush Up Your Shakespeare,” or the explosive dance choreography accompanying “Too Darn Hot.” But, ultimately, this show is really just a collection of bits, a showcase for Porter’s songs rather than anything that’s meant to add up to a story. It’s certain to be more appealing to those who adore Porter’s unique brand of wordplay-filled songcraft, and not so much to those who wonder if his “how many more verses is he going to drag this joke out?” tunes will ever end. The men behaving badly in those productions are nothing compared to those in the season’s two full operas, however. 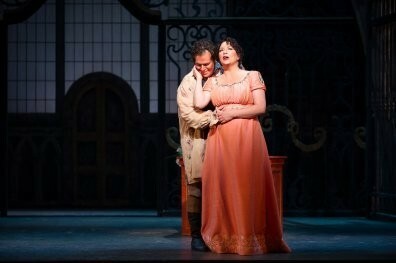 Puccini’s Tosca tells the tale of the titular opera star (Carla Thelen Hanson) who becomes the pawn in police chief Scarpia’s (Jeffrey Snider) plan to entrap Tosca’s lover, the artist Cavaradossi (Jonathan Burton), after Cavaradossi helps an escaped prisoner. The music itself is irresistible, full of glorious themes that contribute to powerful arias. Yet, as dynamically as the production is rendered, it’s almost an intimate chamber piece in terms of its dramatic arc—and the acting performances don’t feel quite strong enough to build the most powerful emotions. That’s not the case in Utah Festival’s Faust, the 1859 adaptation of Goethe’s tale of the doctor who makes a deal with the devil. 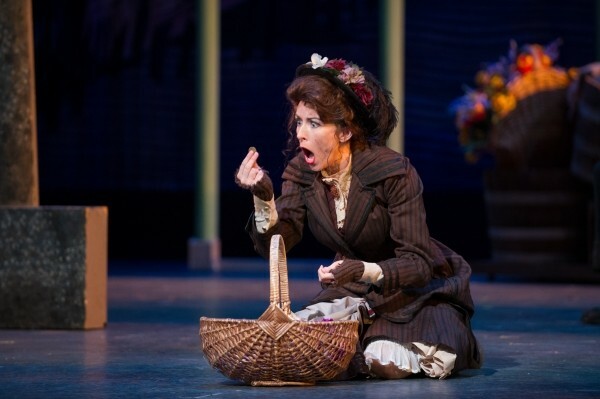 Jessica Medoff turns in a remarkable vocal and dramatic performance as Marguerite, the maiden whose innocence entices Faust, with Pfortmiller—the season’s Most Valuable Player—strong as Marguerite’s soldier brother, Valentin. The production builds on the theme of seduction—MéphistophÃ¨lés’ seduction of Faust, in addition to Faust’s seduction of Marguerite—toward shattering vocal moments and a haunting third act that makes for a truly soul-stirring experience.